You've probably heard about studies about this, but it is absolutely true. I can't tell you how calming it is when a little fluff ball comes and puts his head in your lap while you're studying and suddenly everything feels a little better. Even just petting my cat while calm me down because I go from thinking about everything that I have to get done to thinking about how much I love him and I'm so happy that I have him. As you've probably read about in a post or two, I have had a hard time falling asleep and staying asleep. But pets are great cuddle buddies and will keep you warm! Again, just petting my cat is relaxing enough that it helps me drift off to sleep. It's also a lot more pleasant to wake up to whiskers tickling your face and purring right in your ear than an alarm clock. For the days when you just can't seem to get out of bed, pets can also help make sure you stick to your routine because they won't let you forget to feed them and let them out. Okay so maybe I have no clue about the middle part of this, but for sure your pets will make you happy. It's an amazing feeling to come home feeling mentally exhausted and then to see this little cutie so excited just to see your face! No roommate will ever give you a Welcome Home quite like your pet. Plus I guarantee you that there's no way that you can feel bad about yourself when you have your pet loving on you. My cat absolutely does not care whether or not I'm studying. So if he wants to play, he will swat away my pen and then I have a perfect excuse to put the book down for a few minutes. And if he flops on top of my keyboard, well then darnit I guess that memo will have to wait because I need to pet my kitty. 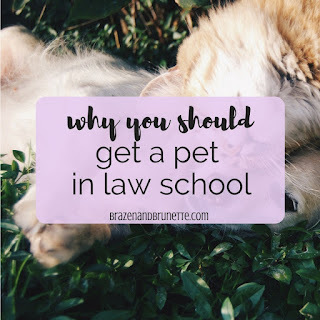 And you can't be up at the law school for 12 hours a day if you have a dog that needs to be let out and walked. They get in your way less than you'd think because you're going to need these breaks before your eyes start to hurt. If you're having a hard time fitting a workout into your schedule, then having a pet will give you an excuse to get out of the house and walk around the block a few times. Plus they always seem to run away from you at the most inconvenient times so then you can get some sprint work done while you're chasing after them. True story, there's lots of people who have lost weight just by getting a dog and taking him on walks. If you live alone, it can be a little scary at times because you're all alone. If you have a dog (or hey even a cat), then you can sleep a little better knowing that if anyone tried to break into your house you'd for sure know because they'd be going crazy barking or meowing. But if you do have a dog, you'll have the extra security feeling because they can scare away an intruder and maybe even attack them. One unexpected struggle that most law students have is dealing with loneliness. Not only are you usually moving away from all of your college friends, but law school isn't exactly the most social place. There's no sororities or dorms or any of the other common ways that you made friends as a freshman, so sometimes it can be hard. Having a pet will at least give you one friend when you're starting out. Dog parks and puppy training classes are filled with fellow animal lovers so it makes it easier to meet people because you already have one thing in common and usually will see them on a regular basis. Boom look at you making friends in a new city! Pets also are great ice-breakers so maybe you'll even get a date out of it, too. Either way, having a pet can help get you out of the house which is a big thing if you're starting to turn into a hobbit. Since your pet does so much to make your life better, it's always a good idea to return the love and spoil them! 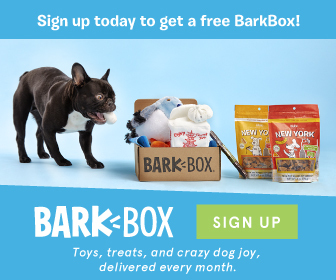 An easy way to spoil them is through BarkBox because then every month (or however frequently you choose) they get new treats and new toys. Plus, BarkBox gives 10% of their proceeds to animal shelters and their BarkGood program helps over 3,000 shelters and rescue groups in the US and Canada ❤️ But PS BarkBox people it'd be nice if y'all made a kitty version! But I am realistic and I know that not everyone would make a good pet parent, some apartments aren't pet friendly (c'mon we all know the carpet is old and the "wood" floors are really laminate), and sometimes you aren't in a place in your life where you can get a pet. So here's a few ways to get your pet fix without the commitment. Volunteer at an animal shelter! Sure they can always use help picking up poop, but then afterwards you can walk the dogs for them or play/socialize with the animals. This will still put you in a feel-good mood, plus now you're racking up tons of volunteer hours to throw in on your resumé and show that you're a good person. It's great for the animals too because they have some human interaction and get to have fun while they wait for their new home. Foster a pet! If you know you might be moving soon or something like that, a short-term way to have a pet is to foster one. What you do is take an animal home from a shelter and it will live with you for a little bit until a permanent home is found or it can be re-introduced to a shelter. When the pet is with you, it's learning how to interact with humans, when and where to potty, and maybe a few tricks. This all helps the animal be more adoptable because it'll be more outgoing and well behaved. And if a shelter is full, by you taking care of the animal until a home is found may save it from being euthanized! You can also foster a service animal in between his placements. Train a service animal! I'm a Delta Gamma alumna and our philanthropy is Service for Sight so the program that I'm most familiar with is Guide Dogs for the Blind. What you do is commit to about a year of raising and training a puppy that will soon be someone's seeing eye dog. Since you're training it to be a guide dog, you basically can take your puppy with you everywhere where a service animal goes and usually apartments are a lot better about allowing service animals. Besides house-training, you'll be training the puppy how to handle sitting through class, movies, car rides, plane rides, dates, whatever so that the dog will know exactly how to behave when he's working.